It seems as if Michelle Dillon has found the magic formula this year as she's been enjoying great success with so many of her athletes. We've seen Jodie Stimpson win a European and World Championship silver medal and Stuart Hayes repeat his performances of last year when he finished third in London and won the Malibu International triathlon, Windsor and Blenheim. 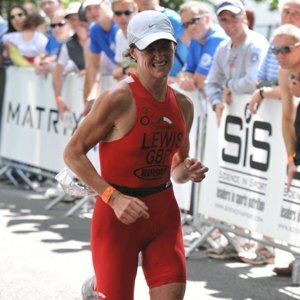 Along with her elite athletes she also has a whole host of age-group athletes that are also performing very well and one of those athletes is Doctor Tamsin Lewis. 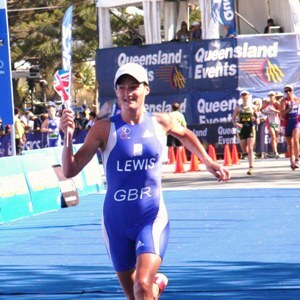 Tamsin Lewis has just returned from the Gold Coast where she won a gold medal in her age-group (30-34) and finished third overall. She also crushed the field at the Hyde Park Triathlon winning by over nine minutes. She's achieved all this at the same time as she's been studying and working as doctor and psychiatrist. I caught up with Tamsin to find out about her brilliant 2009 season and what lies in store for her in 2010. AE It’s been altogether an outstanding year, but you saved the best until last - what a fantastic result at the World Championships, you must be chuffed to bits? TL I’m pretty pleased! It was the perfect end to a good season. In the lead up to the race I was lucky to do some sessions with Michelle (Dillon) and some of the GB elite girls (Jodie Swallow, Stimpson and Emma Davis) which really gave me confidence that I could go well. AE It sounds like you were totally in control from when the starter gun went - tell us about your race on the Gold Coast? TL I’m usually a bag of nerves at the start, but on this occasion I felt pretty calm and in control. I knew that my preparation had been good and whatever happened I’d be giving it my all. When the gun went I was determined to get clear water – and that’s what happened – by the time I was at the first buoy it was me and one other girl pulling away. The buoys were pretty far apart so choosing the right line was key. 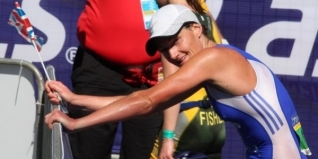 Coming out of the swim and hearing my name on the loud speaker as the first to exit the water was very exciting, but I was also spurred on by hearing that last year's World Champ (Kym Jaenke, who beat Jill Parker in Vancouver), was close on my heels. 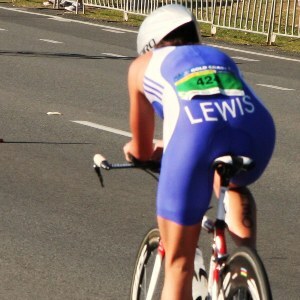 I had a speedy transition and was out on my bike whilst Kym was still taking off her wetsuit. AE What was going through your mind at this point? TL At this point I was thinking I should smash the bike and pull ahead, and was hoping that there weren’t too many super strong cyclists behind me. Cycling has always been my strongest leg, but the flat course wasn’t best suited to me as my real strength lies in hills, and the more technical aspects of riding. I was feeling pretty strong cycling and was pushing hard, but all the time I was thinking I had to hold back a bit for the run. I’m a glutton for pushing big gears, so often I get to the run and my legs feel leaden so this was in my mind too. The bike course had turn around points so I could get an idea where the other girls in my wave were. I could tell I was pulling ahead so that gave me confidence. AE At what point did you think you could win the race? TL I came into T2 and almost lost control of my bike dismounting as I was too reluctant with the brakes. I reckoned that I had a good lead but had no idea how much until Mish shouted that I had two minutes. I knew there were some super runners behind me, and although my run has improved, there were girls who I thought could put two minutes into me, so my job was cut out. The run was pretty relentless! The heat, even mid morning, was stifling and the water stations were definitely a welcome sight. I rarely run on concrete roads so pounding up and down the gold coast highway felt like hard work. My feet were hurting and I was sweating profusely, but knowing that I was winning was intoxicating! It was a fantastic feeling coming up to the finish line and it was great to be able to take it easy and enjoy the atmosphere. One of the medical staff came over as I was lying on my back just lying there smiling and asked if I needed help, I said, 'no thanks, I’m on top of the world'. AE Away from the World Championships you also had several other wins this year including winning the Hyde Park Triathlon by over nine minutes, did you predict such a successful year ahead at the beginning of 2009? TL No, I began the year quite disillusioned, and although I had trained consistently over the winter it was mainly on the bike as it’s the bit I enjoy the most, with swimming and running way on the back burner. In April I went on The TriLiving Camp run by Richard Hobson having enjoyed it so much in 2008. Prior to this I’d not been able to run for four months because of a foot injury so my run fitness was pretty shocking. I threw myself into the training there and with my foot and ankle strapped I competed in the Volcano Triathlon and surprised myself by just missing a podium spot and posting a time 15 minutes quicker than the previous year. This gave me a confidence boost for the upcoming season, but I was worried that my injury would flare up again - thankfully it barely did. AE Where did you qualify for Worlds? TL I qualified for the World Champs at Little Beaver where I was leading right up to the last 2.5k when Lucy Bowen’s run strength beat me down. I’m used to seeing Lucy pass me on the run as its happened in a number of races so I kind of resigned myself to it knowing I didn’t have the run fitness to push harder, yet! AE Michelle has mentioned the fact you may one day race elite is this your goal for the future or do you have others? TL I dabbled with a few elite races this year, Blenheim, Windsor and London. Blenheim was miserable as I was freezing and had a shocking swim. Windsor was awesome as the crowds and weather were incredible and coming fourth (just managing to hold Lucy off) and winning some prize money was a bonus. London was a great experience, competing with the World's best, but I have realised that I need to do some serious swim work if I want to be competitive. Being a strong cyclist really has no benefit in a drafting race. In Windsor Jill Parker and I were pushing the pace on the bike in the chase pack, but when you’re over two minutes down it’s a tough job. AE It's not a surprise that you're a strong cyclist as your dad was a cyclist and raced in the Tour de France and the Olympics, so it would definitely appear that you've inherited his sporting genes? TL Yes, dad (Colin Lewis) was an incredible athlete from the old school of cycling – he’s hard as nails and would often ride for five hours with no fluids and half a banana. I grew up thinking my Dad was a bit super-human, but I know that it was sheer hard work and grit that made him so successful. AE It must be incredibly cool to have his support and to know that he understands your sport and how hard an athlete needs to train to be successful? TL He is really proud of me, which is lovely. As I child he told me I had the talent to be a successful athlete, but it was always a bit of a battle as mum pushed my academic achievements, which I’m grateful for, and sporting acumen took a sideline. Dad taught me that the mind is often the biggest obstacle to going harder. Embrace PAin, make it your friend - its only temporary but it’ll make you stronger. AE Sounds like a good motto for triathlon, which can at times be very tough. It's obviously a sport which suits your mentality but how did you get involved in the first place? TL An ex-boyfriend of mine used to compete in triathlons when we were together at medical school. I used to watch and think I really should do one of these, but it took me years (for various personal and work reasons) to get around to signing up to Blenheim in 2007. I’d been meaning to do a tri for some time, but some excuse about not being able to train enough always seemed to pop up. 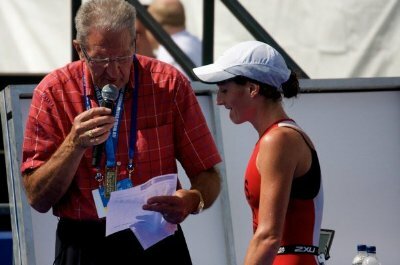 I really enjoyed Blenheim and was very surprised when I was told I had won my age-group. I then thought maybe I should start training so cut back on the booze and gave up my Friday night cigarettes! The London Triathlon was my first Olympic Distance race in August and after coming seventh overall I was picked to join the then Herbalife Academy, which was coached by Bill Black, for one year. At the Northampton Triathlon that same year, in my second Olympic distance triathlon, I qualified for the World Championships in Vancouver. AE Were you training hard as this point. TL No, and to be honest I think I was a bit naïve as to the amount of hard work you had to put in to be a top-age grouper, I was only training between seven and nine hours a week prioritising work commitments. AE How did the race go? TL My first Worlds experience wasn't great. I got pretty badly beat up in the swim and had to stop and find my goggles, and breath, before continuing. It was so freezing that I didn’t feel my feet for the whole race. We were actually in one of the last waves to swim before they turned it into a duathlon. I caught up to fourth on the bike posting the second fastest bike split of the day, but I then struggled on the run to finish 11th in my age-group. I crossed the line saying ‘I’m done with triathlon, I’m taking up cycling’. AE Thankfully you didn't go to cycling and you've now been with Team Dillon for just over three months. 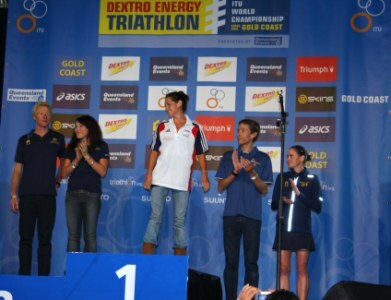 It must be hugely inspirationally to be coached by someone who themself has been such a successful triathlete? TL I have nothing but praise and admiration for Michelle. She’s hugely focused, driven and seems to have huge amounts of energy and joie de vivre! She recognises some of the more unique needs of female athletes and having been there and done it herself she knows the intricacies of the sport inside out. I only wish she knew how I could swim faster without having to do more swimming! AE I think a lot of triathletes would be very happy if she could work that one out! The whole Team Dillon concept is very exciting and it seems that the success of one athlete rubs off onto another as everyone's doing so well at the moment? TL Indeed, there’s a big positive vibe in Team Dillon. Jodie’s success has been really exciting and its inspired me. Having only been training with the team for a few months I still feel I can make big improvements. AE Do you have any plans to take time off work and go full-time for a while? AE I would love to be given the opportunity to take time out of work and train full-time. At the moment I feel I’m constantly chasing my tail and have very little down-time. I’m taking my final Royal College of Psychiatrists exam on 22nd October and if I pass that I can look more seriously at taking time out to train. It’ll be tough though, as I have an amazing propensity to witter away money! AE When you do have some 'down time' what do you do? TL I’m pretty passionate about my work as a doctor and psychiatrist so I keep up to date with the latest research and ideas. I also enjoy teaching medical students twice a month. My favourite way to spend an evening is with good company, stunning food and a top notch bottle (or three) of red wine. I’m also fond of hitting the dance floor, but I never seem to have time to go out at the moment. Barring that I spend a hefty chunk of my salary on massage and spa membership! AE You've obviously been training pretty hard this year, how do you fit training around your work? TL As I said, I’m always chasing my tail and have to make a real effort to turn up to work on time. Having said that my colleagues are (mostly) pretty good as they do respect my achievements and know that when I’m at work I’ll put my head down and get everything done. I absolutely hate getting out of bed before 7am, years of being on call and being woken up by a bleep have moulded the reluctance in my brain to be woken up by an alarm, so I rarely train before work; its lunch time and evenings only for me. AE You’ve mentioned before about your interest in sports psychiatry, can you explain a little more about what's involved? TL Sports psychiatry is distinct from psychology in that it focuses more on emotional issues which can affect performance rather than goal setting etc. For example, eating disorders are common in sport, as is bipolar disorder (Manic Depression), OCD (Obsessive Compulsive Disorder), ADHD and addictions. Unfortunately there is still a residual stigma attached to mental health issues but this is rapidly being addressed as the their range and extent becomes increasingly understood. My general training as a doctor and speciality training as a psychiatrist in addition to experience in sport has improved my understanding of these conditions and how best to treat with the aim of enhancing performance and well-being. I am lucky at the moment to be working under Dr Phil Hopley at The Priory whom has a Sports Psychiatrist Consultancy in central London looking after some of the top football and rugby players in the world. As an ex-professional rugby player himself he has given me a great insight into how to develop as a sports psychiatrist. AE It certainly sounds like a very interesting job? TL Yes it is, and combining two things I love in one seems an ideal way to spend one’s life. AE So now with a great coach and some fantastic results to build on, what plans do you have for 2010? TL The plan next year is to race the domestic elite races and on Michelle’s advice I will look at doing some non-drafting races in the US. AE And perhaps one day an Ironman? TL I think a trip to Kona would be great, but for the time being I've got enough to focus on! For all the twitter users out there you can follow what Tamsin's up to at her username SportyDoc. Strange that Tamsin should say that she faced a `battle` to become an athlete because of her academic mother. She was Regional winner Tetrathlon aged 11. She ran for school in 1500 Devon champs. Won all over country equestrian show jumping/ cross country. She only discovered cycling when she was a qualified doctor.